CSBC Corp., Taiwan has allied with Taiwan International Ports Corp. and Yang Ming Marine Transport Corp., in order to tap the huge business potential for maritime engineering works for offshore wind power. Many other local enterprises will also join the alliance for the huge undertaking, as over 60 companies attended the "assembly for subcontractors for maritime engineering works for offshore wind power," held by CSBC on Oct. 24. CSBC will start building large-scale erection boats in 2021, which will join its existing tug boats and barges to form maritime engineering fleet for installation of offshore wind power turbines. 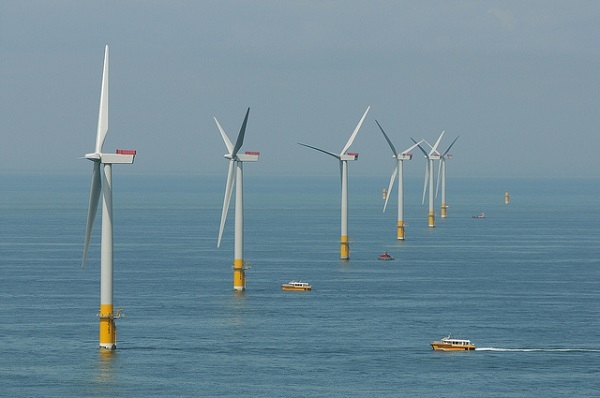 Moreover, it plans to establish an offshore wind power engineering company, dubbed CDWE, in Nov. 2018, for the construction and repair/maintenance of offshore wind-power turbines. Speaking at the CSBC assembly for subcontracts, Wang Mei-hua, vice economics minister, pointed out that the government's policy aims to boost the share of renewable energy to 20% by 2025, including 5.5 GW offshore wind power capacities, as a result of which intensive construction works for offshore wind power facilities will be underway starting 2019 through 2025, with total investments reaching staggering NT$900 billion. The government has formulated, said Wang, measures facilitating participation by domestic enterprises in the gigantic undertaking, in order to foster the development of indigenous offshore wind power industry. The enormous business potential has also attracted many foreign investors, which will bring management experience and advanced engineering technologies for offshore wind power projects, lowering the risks of construction works and facilitating the development of indigenous technologies, which will assure smooth development of wind fields, as well as smooth operation and repair/maintenance in the future, leading to efficient generation of wind power. Cheng Wen-lung, CSBC chairman, noted that with over 40 years of experience for port engineering works, Taiwan has accumulated abundant experience and technologies in maritime engineering works, including ship and machinery maneuvering, grip on oceanic conditions, local fishing conditions, and harbor construction. In fact, CSBC has formed a team for engagement in maritime engineering works since 2013, which now consists of over 100 members, including technicians and engineers. The team has completed a number of projects, including installation of an offshore weather observation tower and an exemplary offshore wind field. Cheng reported that CSBC has reached an cooperative agreement with GeoSea of Belgium for undertaking maritime engineering projects on a turnkey contract basis, in the hope of making Taiwan an vanguard in the supply chain offshore wind-power industry in Asia-Pacific. Huang I-ping, director of the preparatory office for CDWE, expressed that localization of the offshore wind power industry is a formidable undertaking, involving holding of open bidding for the development of offshore wind field, maritime construction works, overall project management, and cost control, which need not only professional manpower but also dedicated equipment. CDWE has contacted various wind-field developers, such as CIP, Zhongneng, Ørsted, and Hai Long, and has been in talks with 17 local shipping and machinery firms, for foraying into the maritime engineering market jointly.